Jane Austen’s characters attended assemblies, routs, and parties so often that one is left to wonder: Did these people never stay home? Indeed, with such a throng of people inside an enclosed space and candles blazing on hot spring and summer nights, the rooms would have been stifling. Had the windows and doors not been kept open, the heat and lack of fresh air would have been insufferable. People often needed to step outside to the terrace or gardens to gain some relief from candle smoke, body odor, and fetid air. 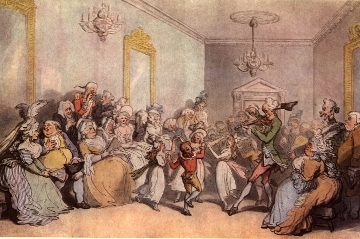 As you can see from this illustration of the Assembly Room in Bath by Thomas Rowlandson, the public assemblies also provided opportunities for dancing. One must surmise that private and public assemblies differed in character. The size of a hostess’s house and her budget must also have dictated whether she could also provide music and dancing at her gathering.